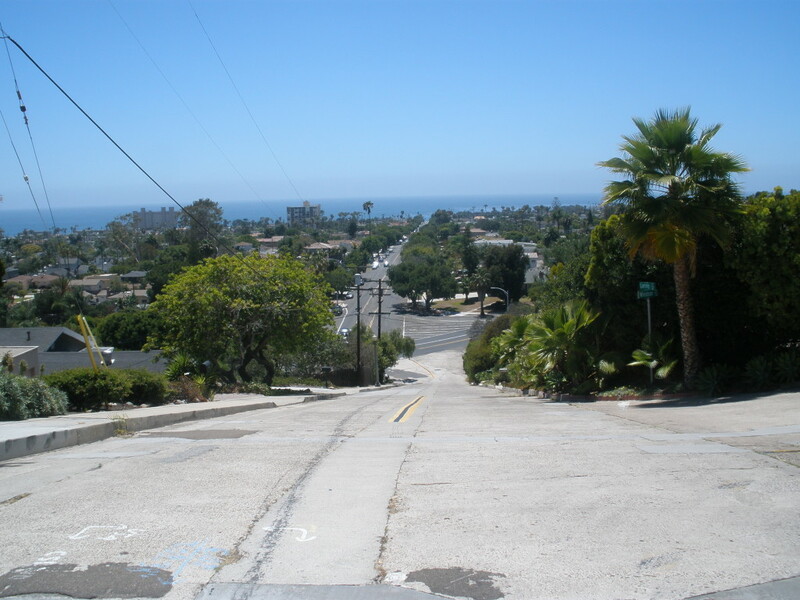 Loring Street in Pacific Beach is known for the steep hill which angles up sharply from the coastal plain to the Mount Soledad foothills in the length of a single city block. The panoramic view from the top of Loring Street Hill is one of the reasons that the area is now crowded with expensive new residences, but one home in particular stands out from the rest, and has for nearly ninety years now. Located on the north side of Loring at the very top of the hill, and distinguished by the long flight of steps leading up from the street, this home has been known to generations of PB residents as the ‘Loring Hill House’. The Loring Hill House was built in 1926 by Josephus Marion (J. M.) Asher, Jr., a local real estate operator. Asher was born in 1878 in San Diego, one of the first children of American settlers (his older sister Josephine believed she was the first settler child). His parents had been friends with Alonzo Horton in San Francisco and followed him to San Diego in 1869 where the senior J. M. Asher established San Diego’s first nursery and florist shop, later acquired by Kate Sessions to launch her noted horticultural career. J. M. Asher Jr.’s career was also noted, not only for his real estate ventures in Pacific Beach, Bay Park and Mission Beach, but also for pursuits as varied as singing and marksmanship. In 1905 J. M. Asher, Jr., married Mabel Olive Littlefield in the first wedding to be held at the Hotel Balboa in Pacific Beach, the newly remodeled buildings of the former San Diego College of Letters, built in 1888 but closed in 1891. Both the bride and groom were musically inclined; Mr. Asher was renowned as one of the best bass soloists on the coast and Mrs. Asher was an accomplished pianist (especially ragtime; her composition Cinder-Ella Rag was published in 1910). The couple had apparently moved to San Francisco where they and her brother Warren Littlefield ‘passed through the horror’ of the great earthquake of April 18, 1906, losing all their possessions and spending several nights in the open air after narrowly escaping death from falling buildings. They retreated to Pacific Beach, where her parents had a home, ‘overjoyed to reach a place where such calamities are unknown’ and planning to remain some time to recuperate from the ‘terrible nervous shock’. The two brothers-in-law formed the real estate firm of Asher & Littlefield, specializing in Pacific Beach, where they acquired large holdings of property in the first decade of the twentieth century (their trademark was a clover leaf, their slogan ‘you will find the bargains at the sign of the 4-leaf clover’). When Warren Littlefield returned to his native Maine in 1910 Asher continued the business on his own, branching out to Bay Park and subdividing Asher’s Clover Leaf Terrace subdivision in 1913 (where Asher and Littlefield Streets join Morena Boulevard). 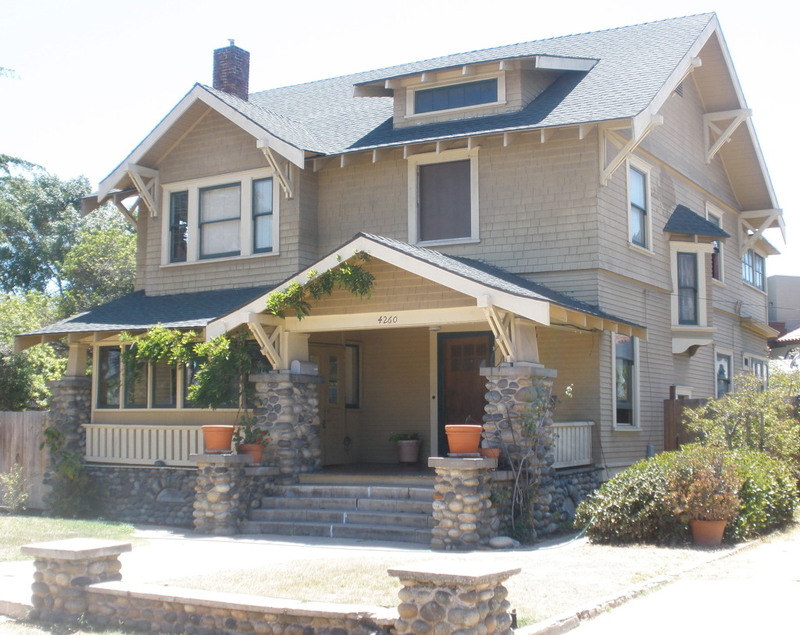 Also in 1913, Asher acquired the northwest corner of Kendall Street and Reed Avenue in Pacific Beach and built the home with the cobblestone porch that still stands today. In 1914 a syndicate of investors purchased the sandy peninsula between the Pacific Ocean and Mission Bay and subdivided it as Mission Beach. A bridge was built across the opening of Mission Bay and a rail line laid from a connection with the Point Loma Railroad in Ocean Beach across the bridge and as far north as Redondo Court in the new Mission Beach subdivision. The Mission Beach Syndicate planned a beach resort at the far end of the line and to develop this new resort the syndicate turned to Asher, granting him a large slice of North Mission Beach, all of the property between Santa Clara Place and San Jose Place plus the property east of Mission Boulevard between San Jose Place and Tangier Court, all then empty sand dunes. The terms of Asher’s contract required him to set up a tent city, grade and surface the streets, install wooden curbs and sidewalks and construct a bath house, swimming pool and pier, all by October 1, 1916. Asher set up the Mission Beach Tent City Company and went about achieving all of these objectives. For his efforts he has come to be known as the ‘Father of Mission Beach’. He also built a home on Bayside Walk and in 1918 the Ashers moved from Kendall and Reed to their new home at Mission Beach. The Father of Mission Beach did not entirely turn his back on Pacific Beach, however, and in the 1920s he acquired a portion of Acre Lot 11 adjoining the Pacific Beach reservoir site and Kate Sessions’ Soledad Terrace subdivision (where Kate Sessions was having her own house built at about the same time) and began building the Loring Hill House. A building permit was issued to J. M. Asher in February 1926 for a garage in Acre Lot 11 valued at $1000 (at about the same time a permit for a garage on Hornblend was valued at $150). In June, a permit followed for a stucco residence in Acre Lot 11 valued at $15,000 (while a permit for a board house on Noyes Street was valued at $800). Construction was completed before the end of the year; a December Mission Beach Notes column reported that Mr. and Mrs. Asher had moved to their new home ‘on the hills adjoining Mission Beach’ and a promotional piece for the North Shore Highlands development included a photo of the Asher residence ‘which commands a typical North Shore Highlands panoramic view of ocean, bays, Point Loma, the city and mountains of old Mexico’ (there was also a photo of the ‘new’ Dunaway building in PB’s ‘business center’). In succeeding years society columns frequently reported luncheons and bridge parties at the Ashers’ residence. In addition to his business career and his musical achievements J. M. Asher, Jr. was a noted sportsman; he had been a championship swimmer and in 1907 he reportedly caught 30 fish in the surf at Pacific Beach. However, the sport in which he achieved his greatest success was target shooting. In 1923, as a member of the San Diego Rifle and Revolver Club, he competed against a team from the U. S. Marine Corps for the ‘Asher Trophy’, which he had donated to promote greater interest in rifle shooting (this time the marines won). By 1925 he was the ‘high gun’ on the California civilian rifle team that won the national trophy at the National Matches at Camp Perry, the ‘world series’ of shooting sports. He was described as ‘among the nation’s crack shots’ and ‘one of the greatest rifle shots in the world’. He generally won his matches, often with perfect scores, at ranges of 600 or even 1000 yards, and often in competition with active-duty military marksmen. 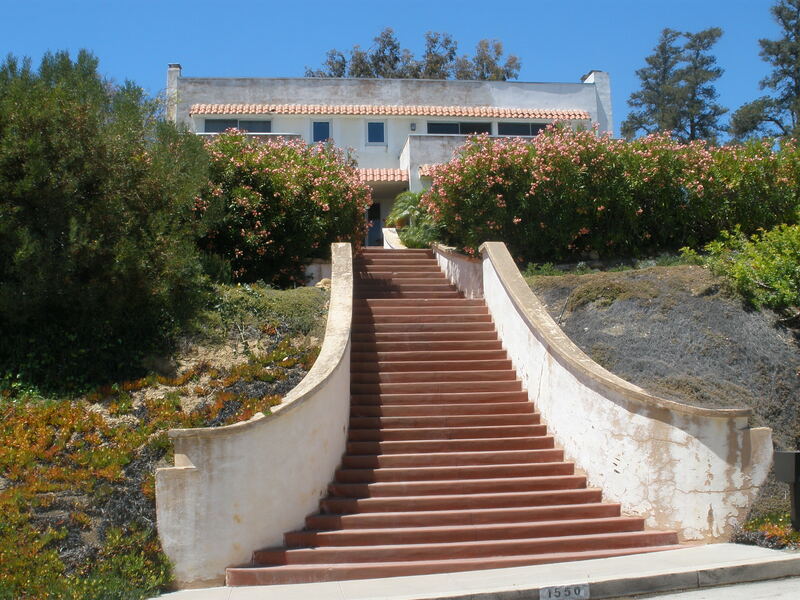 One of the factors contributing to Asher’s success may have been the rifle range that was built into the Loring Hill House; a later real estate listing noted that in addition to being one of the highest spots in Pacific Beach with a million-dollar view, the house included a ‘shooting gallery’ (in addition to riding stables and butler and maids quarters). However, the Ashers’ residence in their new home above Loring Hill was a limited one, presumably due at least in part to the Great Depression of the 1930s and its effect on the San Diego real estate market. By 1932 they had moved back to their Bayside Walk home and the Loring Hill House sat vacant. In Mission Beach J. M. Asher Jr. took over a gas station on Mission Boulevard which he leased to his son, J. M. Asher II. He also apparently worked there himself; where City Directories had once listed him as ‘Capitalist’, by 1939 he was a ‘station attendant’ at Asher’s Service Station. In 1942, at a time of wartime rationing, Josephus M. Asher was the operator of a service station on Mission Boulevard fined $25 for selling gasoline illegally, in cans that were greater than one gallon and not painted red and labeled ‘gasoline’ in letters at least one inch high. J. M. Asher, Jr. died in 1954. A brief notice in the San Diego Union described him as a member of a pioneer San Diego family and a developer of Mission Beach. J. M. Asher II enlisted in the Navy during World War II and was lost in 1943 aboard the submarine USS Corvina. When Mission Bay was dredged and reborn as Mission Bay Park in the 1950s one of the coves created by Santa Clara Point, near his parents’ home, was named Asher Cove in his honor (but renamed in the 1960s over the protests of his mother). Mabel Asher sold their Bayside Walk property in 1965 to a group who intended to build the 9-story ‘Asher Towers’, but with public sentiment running against high-rise developments in the beach areas they settled for the three-story condominium which is there now. When Mabel Asher died at 89 in 1969 she was living in a duplex on Diamond Street near Cass and still playing the piano, although failing eyesight prevented her from reading music. After the Ashers’ departure in the early 1930s the Loring Hill House remained vacant for a few years but since then has been home to a succession of residents including, in 1938, San Diego’s primary Hupmobile dealer. More recently even more imposing homes have been built on neighboring properties, including further subdivisions of the Ashers’ original lot in Acre Lot 11. 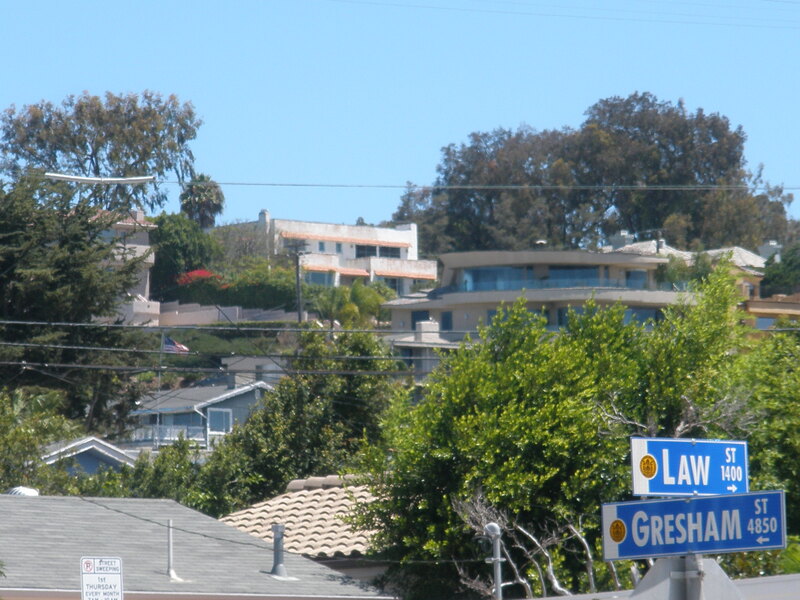 While these homes may share the view, they can’t claim the heritage of the house which has looked over Pacific Beach (and Mission Beach) from the top of Loring Hill since the 1920s. I grew up in the ’70 ‘s to 2000 on the block of Loring just below the hill. Always wondered about that house. Great information. Of course, mostly just used the hill to ride skateboards while seated and try not to end up an ugly human smear on Ingraham St! My Aunt & Uncle bought that home in 1959, raised their family, and my Aunt lived there until my Uncles passing when the family sold it. So many fun memories, running in the fields behind the “maids quarters”, the rifle range, the laundry chute, the challenge of making it up the dirt driveway after a rain storm created huge ruts, all the awesome fireplaces. The 53 stairs counted so many times to get to the front door and visions of my Uncle watering that beautifully manicured front lawn. Wish we could’ve bought it and kept it in the family back then. My mothers family grew up in this home! It was a magical place for my mother and all of my aunts and uncles to grow up( and later, myself and my cousins.) We all have very fond memories of this home and are glad to see it still stanging as it did years ago. I will always remember the years that I got to live in the “loring street house”. Great Information; Sarah [Clark] Asher, JM Asher Jr’s mother would have been my GG Aunt. Her mother was the first Headmistress of the Toronto Normal School and in 1962 sent Helen Milliken Clark (my G Grandmother) to California to become the first teacher in California Educational system. Three daughters who came to California; Emily, Helen and Sarah were all teachers and musical. JM Asher lived with his cousins in SF around 1900 and studied Opera (worrying about the effect of “fog” on his voice”. His brother was Robert Haley Asher, the “Hermit of Palomar Mountain” who donated the land where the PCC (Palomar Christian Camp) exists today. He collected seeds, bulbs, was a photographer, poet and writer. Sister Josephine was a pioneer teacher as well. My wife and I purchased the Asher house on the NW corner of Kendall & Reed in the summer of 1992 from Paul Robinson, who was married to the youngest daughter of the Barnes family. The Barnes family purchased the house in the 20’s, and was their home for two generations. The property was deeded to the daughter upon her marriage, although the widowed Mrs Barnes lived in the house until the early 50’s. The house as shown in your photo is close to the original paint color scheme which replaced the white paint of the 40’s. In 2014, the great niece of the actual builder, Frank Challand, visited us after attending her 75th reunion from La Jolla High. My wife, Therese, and I grew up in the defense housing before our families bought on Diamond and Chalcedony, so we remain true “locals”. Looking back at what used to be . . . mostly in San Diego and especially Pacific Beach.